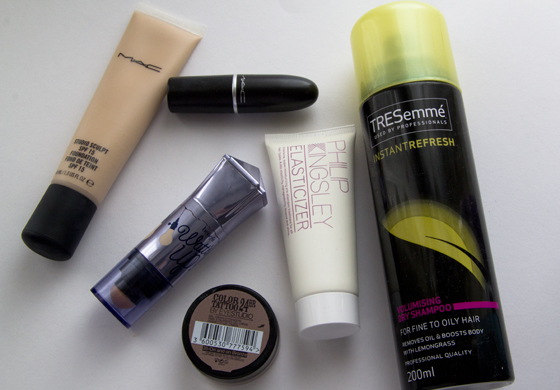 It's time for May favourites, I didn't use too many products this month as I was super busy. I didn't also have much time for shopping and now we are out of showers gels, will stock up on everything this Friday. Of course I do still shower, I'm just using sample stuff from Beauty Boxes. Can't wait for the big Boots shopping spree. I used up most of my skincare products as well. Let's go back to the actual post. 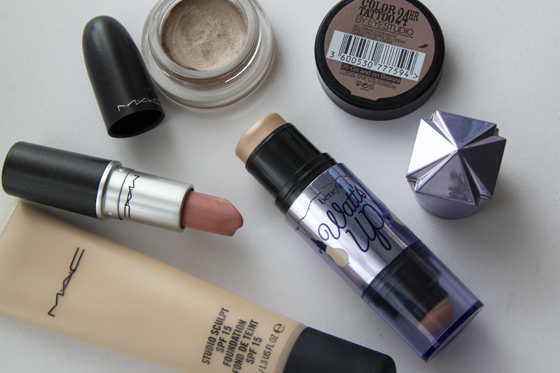 MAC Studio Sculpt Foundation, I had ordered this from a blog sale, so I saved some pennies. I must say that this is my NEW favourite foundation! The gel formula is amazing, the foundation is very smooth and lightweight on the skin. I will soon do a full review on it, I'm saving it up now for summer holiday. MAC Lipstick in Hue, is my new obsession when I first got this lipstick, I wasn't sure about it, but now I love it. I also accidentally had dropped it. The colour is great to wear on daily basic. Benefit Watt's Up Highlighter, you can read the full review here. I'm finally got back to using a highlighter, I kept on neglecting them, as I thought that I don't need any more shine on my face. Maybelline On and On Bronze, you can read full review here. It's so simple to use and it's brings out my eye colour. The lasting power is really good too. Philip Kingsley Elasticizer Hair Treatment, another amazing product. I'm planning to buy full size of this, I went through two samples already. This products leaves my hair super soft. One things that annoys me is, that you have to use it on dirty hair. TRESemme Dry Shampoo, you can read full review here. I had few issues with my hair this month, my hair kept on getting oily as well as they had been super flat. I'm almost out my second bottle. This is the best dry shampoo I ever tried, as it doesn't leave the powdery feeling. *Full reviews of unlinked products are coming soon. That's my favorite dry shampoo also! Looks pretty close to birthday suit!! I love the maybelline colour tattoo, I use them all the time, wish they'd bring out more colours though!